Region: This fly is found throughout North America in various species. Life cycle: This insect produces several generations each year and hibernates in cocoons within the soil. Physical Description: This 1/10 of an inch black fly has yellow stripes and lays its eggs on the surface of leaves. The larva is yellowish and is very stout and worm-like. Feeding characteristics: This pest attacks azalea, bean, birch, blackberry, blueberry, boxwood, cabbage, chard, chrysanthemum, columbine, holly, lettuce, lilac, morning- glory, nasturtium, oak, parsnip, peppers, potato, spinach, and turnip plants. 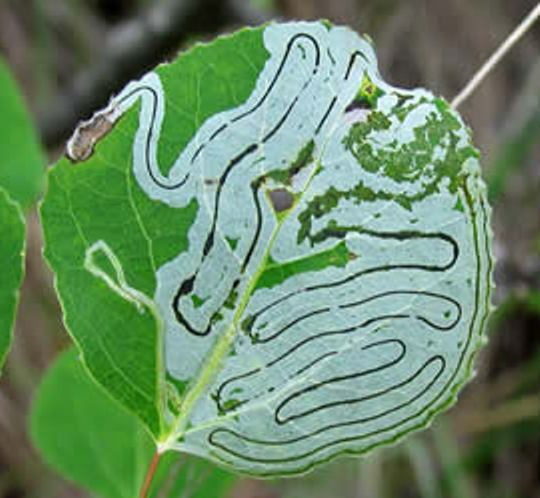 The maggots mine under the surface of leaves, resulting in the formation of white tunnels. 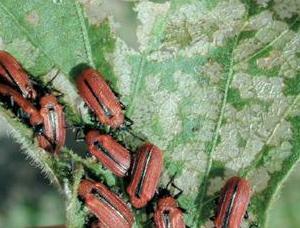 In some related species of these pests, they will chew the leaves giving them a blotchy look. Controls: When an infestation is noticed, remove any damaged leaves and destroy them. If this is not adequate control, you can dust with Bacillus thuringiensis.